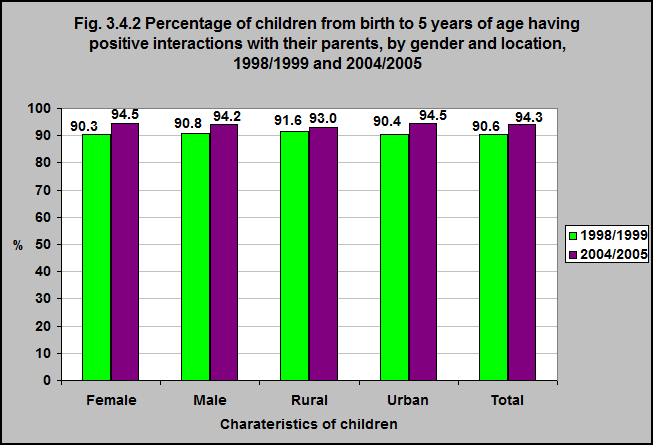 Source: CICH graphic created using data adapted from the National Longitudinal Survey of Children and Youth, Cycles 3 (1998/99) and 6 (2004/05). http://publications.gc.ca/collections/collection_2009/rhdcc-hrsdc/HS1-7-2008E.pdf -accessed July 26, 2017. The majority of children (0-5) had positive interactions* with their parents. That was the case for 94% of children (0-5) in 2004/2005, up from 91% in 1998/1999. This was the case regardless of gender or whether the child lived in an urban or rural community. *The National Longitudinal Survey of Children and Youth (NLSCY) and Survey of Young Children (SYC) use a scale from 1 to 20 that measures positive parenting behaviours – such as praise, talking, playing and laughing together.